Through our custom sauce development process, our experts will develop precisely the product you didn’t know you needed. 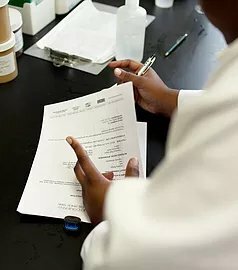 We can match any formula for you or develop completely unique recipes to match your specific needs. With our deep expertise, you can leverage our innovative processes to bring your vision to life. Your needs are unique, and your recipes should be as well. We develop custom formulations so that your sauce becomes an integral part of your brand. According to the 2015 “US Market for Flavors” (produced by market research group Packaged Facts), innovation and experimentation are essential in the current foods industry. Custom sauce formulation is the key to tapping into this market trend. Our collaborative approach means that you’re not just hiring a process. We become your Research and Development wing. You are tapping into decades of experience in custom recipe development. Our research and culinary experts in freeze-thaw and ambient shelf life technology will collaborate with you to create the perfect product. We always ensure your new product retains its taste and freshness from bench to production plant, and on to its ultimate destination. We work with you to achieve the mouth textures and flavors you need and utilize our processes and expertise to keep it consistent throughout the product’s life. We will also provide our technical support and expertise throughout the entire production process. We are the one-stop shop for your sauce ideas. We’ve worked in a wide variety of sauce types, developing new recipes in a diverse array of industries. From sweet to savory, we can deliver the perfect wet sauce for your needs. Our culinary experts can also help you navigate shifting trends in the industrial foods landscape to deliver the product you need. If you have a vision for your custom formulation, talk to us about it, today. We are ready and able to make it a reality.